How about 24 / 7 / 365 democracy? The “Think Outside the Boss” series concluded with over 80 participants and sharing the expertise of 10+ people with experience in cooperatives plus one international expert, Jennifer “Ted” Rau, coming in to guide a two-day workshop on democratic governance in business and community organizations. We are working with three cooperatives in various stages of formation. 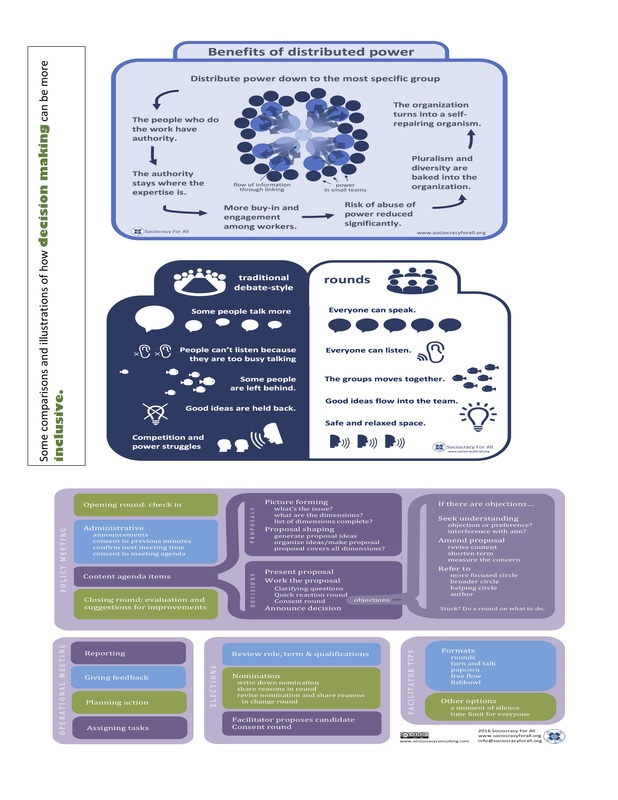 Other collaborations are being explored, too. We have soft-launched the PCOC’s platform cooperative, Covivi, which was inspired by a workshop participant, last year’s Social Justice Innovation Weekend, and a couple of international writers who focus on making the so-called “sharing economy” a real sharing economy. It’s a Pittsburgh area centered platform for people to book their services or to find people whose services they need. We intend to make it a cooperative that uses a booking platform. Check it out and try it out! We’ve spoken at several events as well. 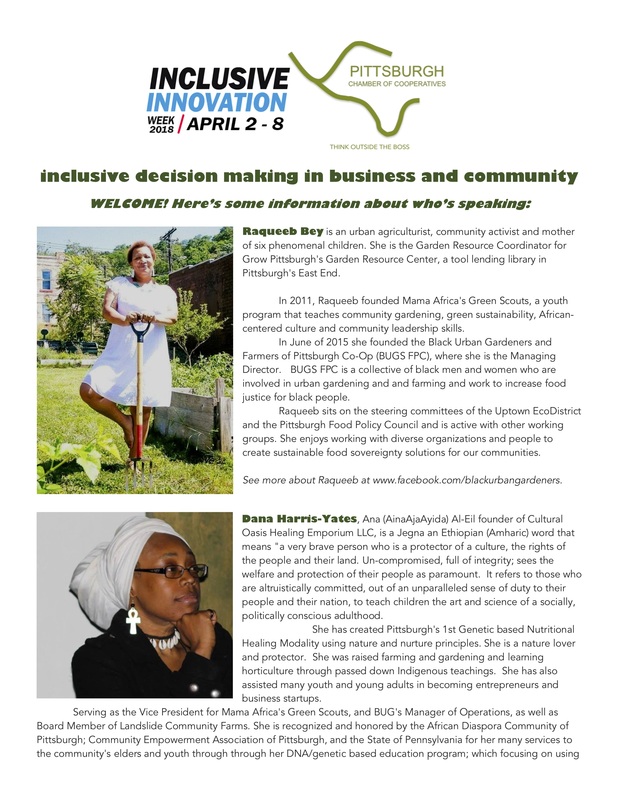 PCOC member organizations Work Hard Pittsburgh and Black Urban Gardeners of Pittsburgh (BUGS) and Fourth River Workers Guild presented a session at the Pittsburgh Community Reinvestment Group’s 2018 Community Development Summit. Joining in were Lakeisha Wolf of Ujamaa Collective and Trevor Young-Hyman from the Katz School of Business at Pitt. BUGS helped to run a hands-on workshop on consent-based decision making at the Pittsburgh Theological Seminary’s Metro Urban Institute’s 2018 Conference. Ron Gaydos, PCOC Manager, and Dana Harris-Yates from BUGS also conducted a session on non-hierarchical decision making as one of the events for Inclusive Innovation Week in April. Also in April, Ron spoke to the Living Spring International Pittsburgh, a congregation in Wilkinsburg of mainly African immigrants and refugees, for a business-themed day of presentations. Ron has been elected to the Board of Directors of the Keystone Development Center, which provides technical assistance and financing for cooperatives in the mid-Atlantic region of the US. Several people from the PCOC and various member groups have been meeting occasionally to discuss cooperative development and governance issues. We’ll get word out about the next one. A group of long-time cooperators dedicated to cooperatives and associated with the East End Food Coop are setting up a study group to increase their skill at cooperative decision making. It’s called sociocracy, dynamic governance, or consent-based decision making, but, to be brief, let’s call it sociocracy. It’s inclusive, democratic, AND efficient. To make our businesses and organizations more democratic, we need many ways to do that. This course is an excellent way to get started! A local, in-person 6-session STUDY GROUP (← see details! 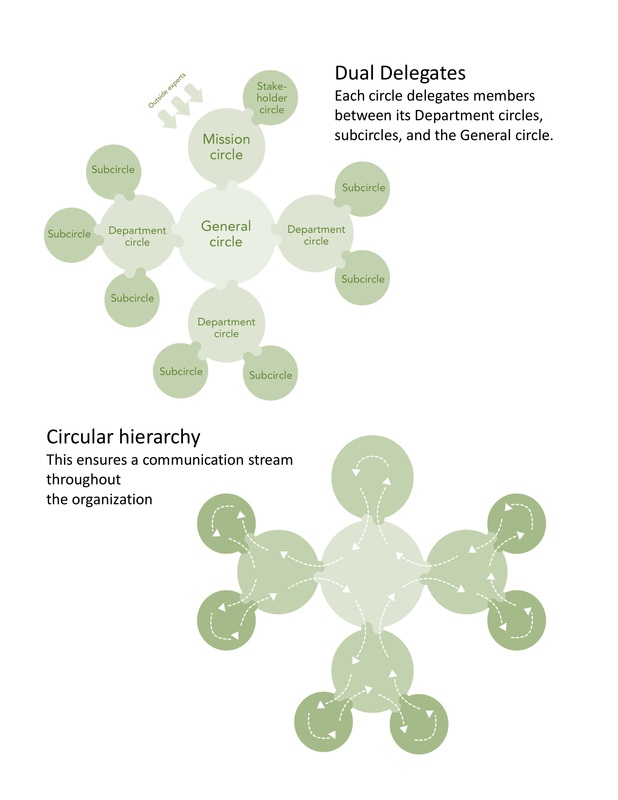 ), is being organized and will be very easy, considering that the organization Sociocracy for All has already put together a curriculum. (The study groups are called “Empowered Learning Circles” and you can see a photo of 7 Pittsburgh Chamber of Cooperatives people who have recently done this at the STUDY GROUP link!) Each class is about 1.5 hours and includes optional readings (15-20 pages/week) + videos that participants watch together. Most of the effort will be toward the decision making practice and exercises guided by the Empowered Learning Circle curriculum developed by the international training group Sociocracy for All. GLAD TO HAVE BEEN A PART OF PITTSBURGH’S INCLUSIVE INNOVATION WEEK! For all the good they can do, many businesses, agencies, and community organizations can also be less than inclusive in their decision making. Increasingly, businesses and community organizations see being more inclusive as a way to create more value in what they do. It’s of course about doing the right thing but also about “firing on all cylinders” and having a diverse set of skills and perspectives in the house.Participants walked out of this event with new acquaintances and colleagues and allies in our quest to make Pittsburgh’s business and community development scene more inclusive, efficient, and vibrant.Here are the slides that framed our talk with everyone who attended. Contact us about how the PCOC can help your organization or business be more inclusive and prosper from everyone’s fuller participation. The 2017-2018 “C-School” (Cooperative School) our Think Outside the Boss Workshop Series! Q&A Throughout. We want your questions! What businesses can you think of that might function well as a co-op? How could a co-op be used to help people start a business that might otherwise not be able to do so? Thanks to the Office of the Mayor, Neighborhood Empowerment, and Small Business Development Manager for co-sponsoring! What next? How can The Pittsburgh Chamber of Cooperatives help you help your constituents and clients? How can we help others who might be interested what coops are and how they work? 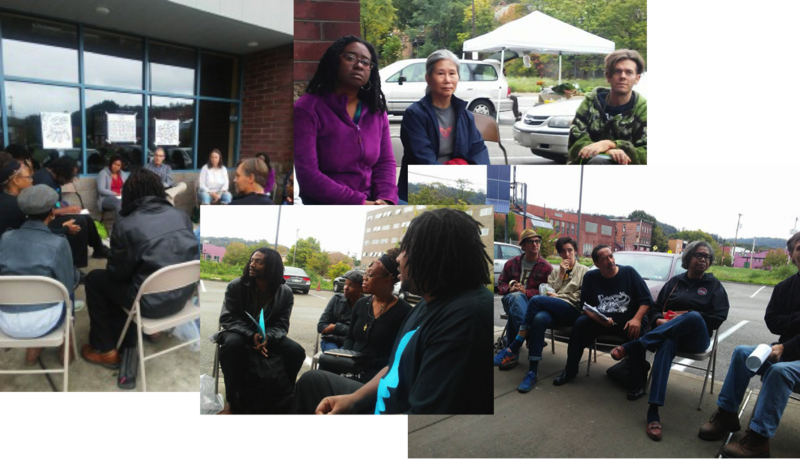 How can we use the concept of cooperatives to create a more equitable Pittsburgh? at One Hope SquareOctober is Cooperatives month! Come out and learn more. Meet members of the Ujamaa Collective women’s artists cooperative. OCTOBER 2018:Pittsburgh Cooperates! A weekend of events with Jessica Gordon Nembhard, a leading voice in the history and workings of cooperatives, and especially Black cooperatives. All free events, co-sponsored by the Black Urban Gardeners and Farmers of Pittsburgh Cooperative, Metro Urban Institute of the Pittsburgh Theological Seminary, Ujamaa Collective, and the Urban Kind Institute! 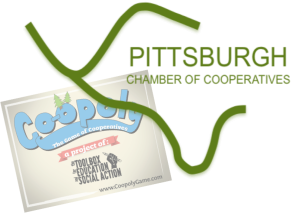 Co-opoly Untournament & Holiday Meet-UpTuesday December 6, 20165-9 PMFuture Tenant Gallery in the Cultural District819 Penn Avenue, Pittsburgh 15222Meet others from the Pittsburgh area working on, interested in, and supporting cooperative business and community initiatives.Refreshments, music, and entertainment.Free, but an RSVP would be great for planning! Free event ~ food and drinks available ~ ID req’d by the establishmentCome to meet Cooperative worker-owners tell their stories of sharing ownership and its radical advantages. Network with other regional businesses, community groups, and entrepreneurs. PLUS a game corner for hands-on learning to run your own co-op! RSVP to stay connected! OCTOBER IS COOPERATIVES MONTH WORLDWIDE! GET A FLYER AND POST IT! Join us October 8 at 11 AM at the Black Urban Gardeners and Farmers Cooperative Farmers Market at 7240 Frankstown Avenue in Homewood. The PCOC will hold a one-hour workshop on cooperatives, focusing on worker-owned businesses.Check back for a follow-up workshop on cooperative business decision making in November! Click HERE to be contacted about it! …Also free of charge. Urban Redevelopment Authority of PittsburghRSVP here (not required but you won’t miss access to helpful resources)This for 1) people who have a conventional business and are considering converting it to a cooperative and 2) people exploring starting a cooperative from the ground up. People in both situations will also have the opportunity to meet people to help with financing, regulatory and permitting and licensing matters, real estate, and workforce development, to name a few important sides of any successful business. 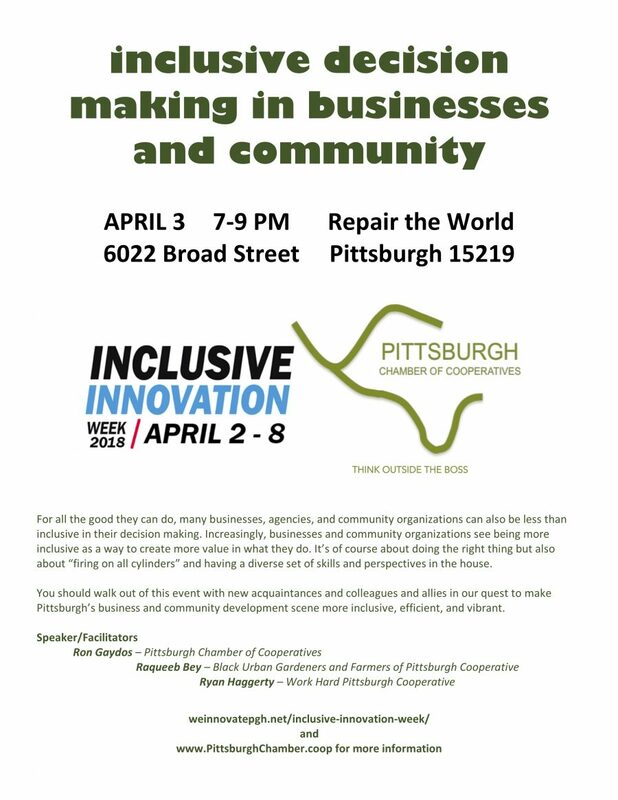 Come to attend and grow Pittsburgh’s democratically owned business scene! Free of charge. 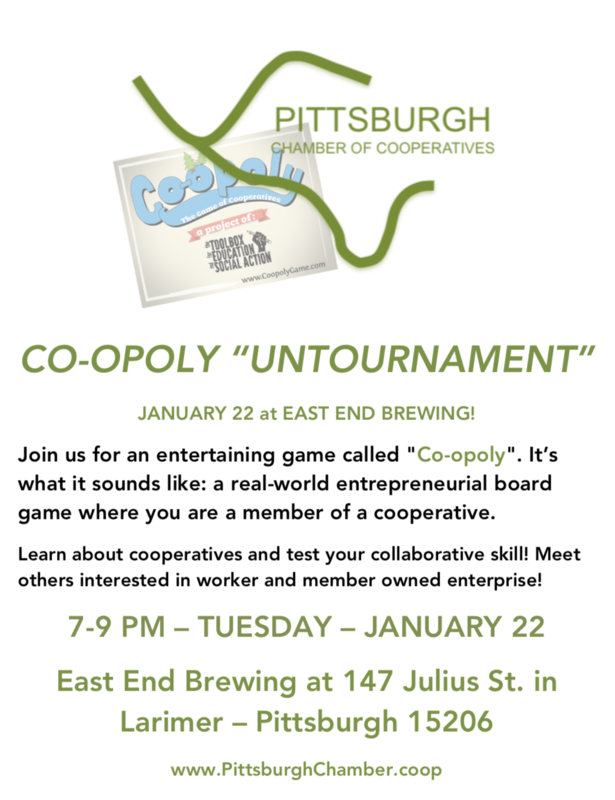 401 Biddle Avenue in WilkinsburgIntro to cooperative business, play a board game that realistically simulates running a cooperative, meet people in cooperative business, and ask your questions. We’ll have answers!RSVP (not required but helps us plan) HERE. We at the Pittsburgh Chamber of Cooperatives would like to meet people who want more from their work and are looking for a better way to make a living. Learn about cooperatives from people you know and some new folks. What are their advantages? Challenges? Meet other folks in your community interested in cooperatives, and hear from members of a worker owned enterprise about their experience. Bring a dish to share if you can. We’ll have a simple dinner for all participants at this FREE EVENT. CO-OPOLY “UNTOURNAMENT”APRIL 12 at REPAIR THE WORLD!Join us for a potluck game night to play “Co-opoly”, a real-world entrepreneurial game where you are a member of a cooperative.Learn about cooperatives. Test your collaborative skill. 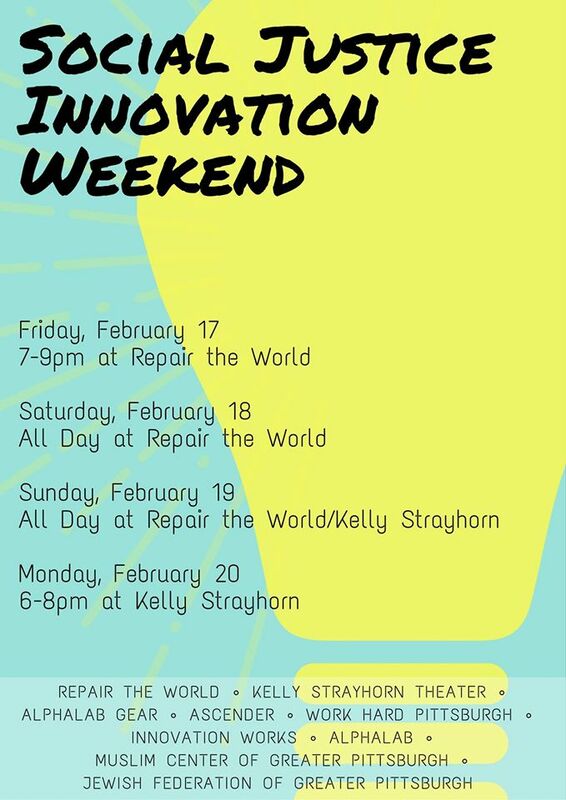 Or just watch.Schmooze with this year’s Repair the World Fellows, other folks curious about cooperatives, and members of a worker owned enterprise. Bring a dish to share if you can. The 30 attendees from around the area listened, asked many questions, and made helpful suggestions on what types of cooperative business opportunities would work best, according to local needs and skilled people available. What if all kinds of workers owned their workplace, and each worker had an equal vote in decisions about running the business? SHIFTCHANGE tells the story of worker-owned cooperatives in cities across the country. 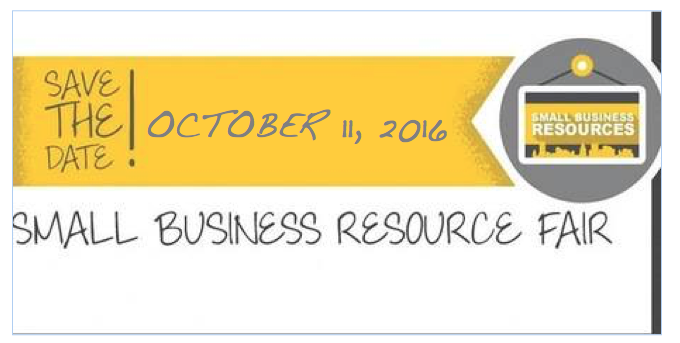 Meet others interested in starting and supporting cooperative businesses! With the Pittsburgh Chamber of Cooperatives and Cooperate Pittsburgh. Bloomfield-Garfield Community Center Gathering of the cooperative “curious, capable, and conspiratorial.” 50+ people interested in cooperatives – from community tool sharing to worker-owned businesses – gathered to meet each other and share their experience and needs.This informs how to proceed with the movement as well as how to prepare practical resources for attendees and future members. SPONSORED BY THE NEW ECONOMY CAMPAIGN OF THE THOMAS MERTON CENTER. Be a part of the cooperative movement to do good while doing well in business. Click the green link above. Thanks! 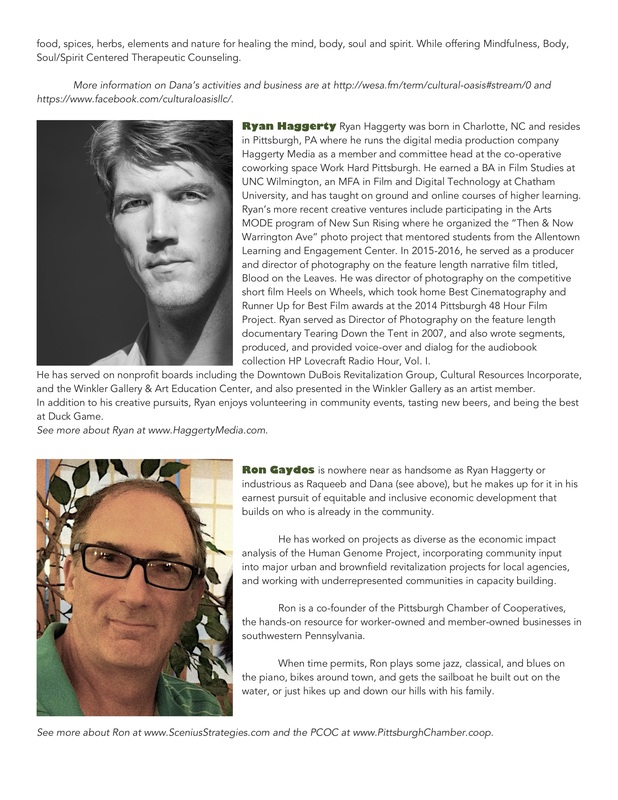 © 2019 Pittsburgh Chamber of Cooperatives. Theme by XtremelySocial.